I am a lover of holidays, festivities, pageantry, and energetic crowds. 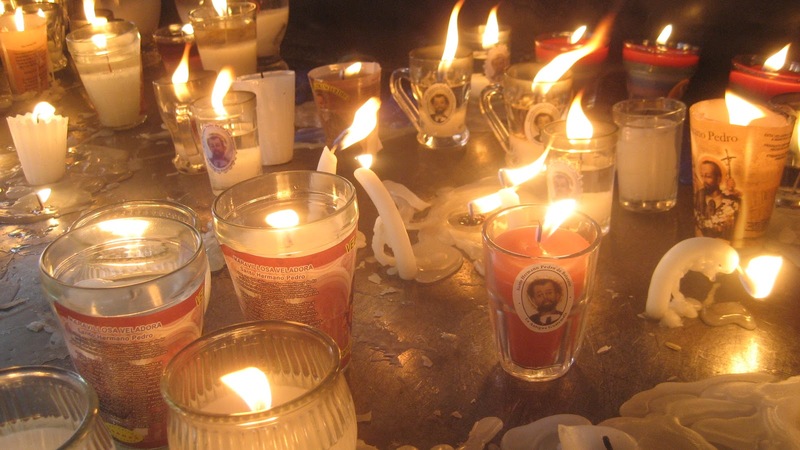 In doing my research before this trip I learned that Antigua has a serious reputation for going all out for Semana Santa, or Holy Week leading up to Easter. Hundreds of thousands of people flock to the city for famous city-wide parades and a week long celebration. 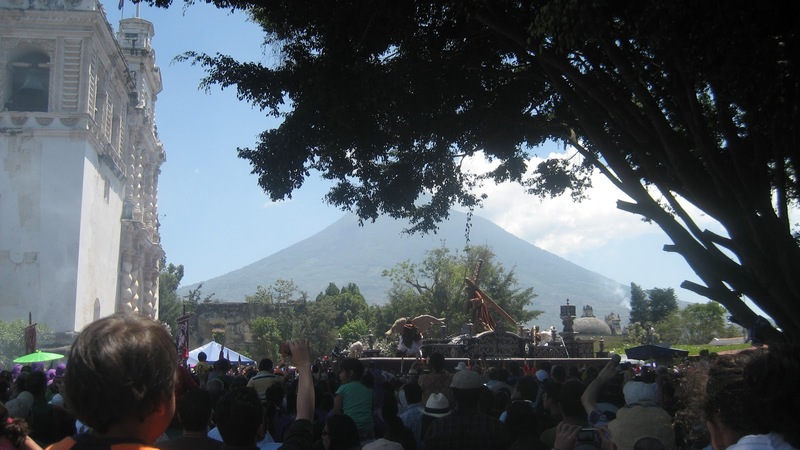 At Lake Atitlan, I met a number of people living in Antigua who specifically left to avoid the crush. 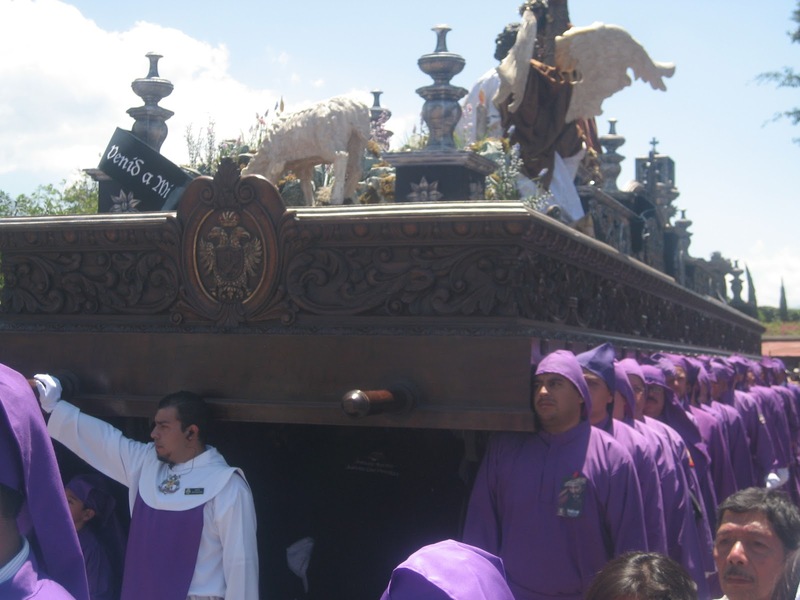 “You won’t truly experience Antigua,” they said, “only Semana Santa! It isn’t the same!” But I have known for months I wanted to be there for it. 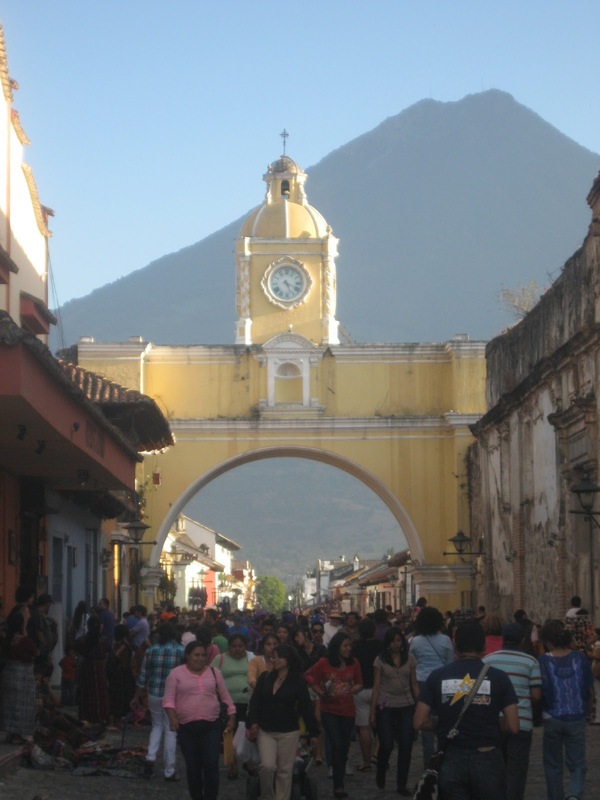 Aside from my arrival and departure, Semana Santa in Antigua was the only appointment I made for myself on this entire trip and I meant to keep it. My first stop: Iglesia de San Francisco. Guarding the secret back entrance! 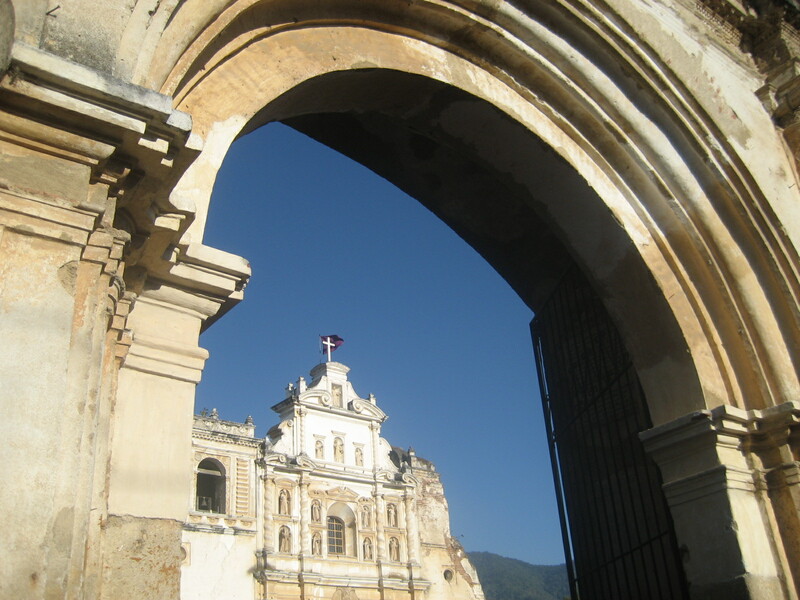 My first full day in Antigua was Maundy Thursday (the day of the Last Supper) and that morning I set out to find the action. 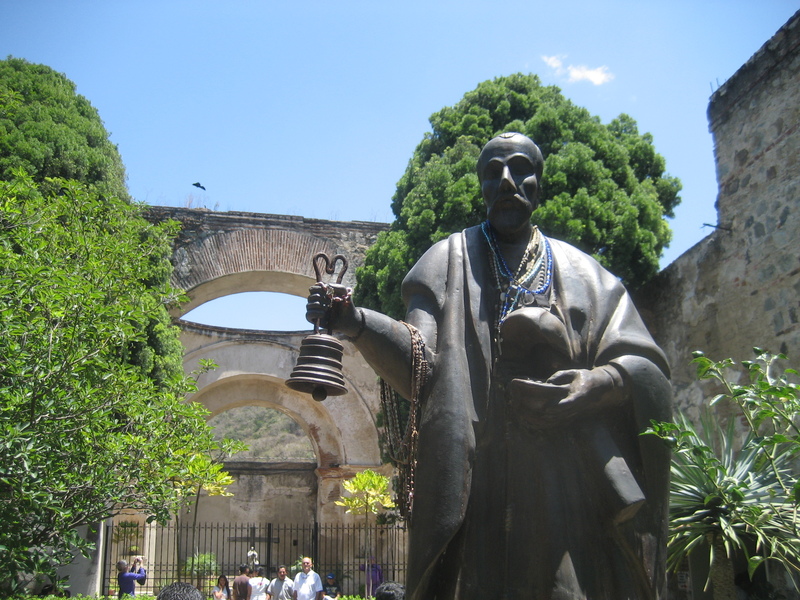 I began by walking towards a large church, Iglesia de San Francisco, that I had found the night before. 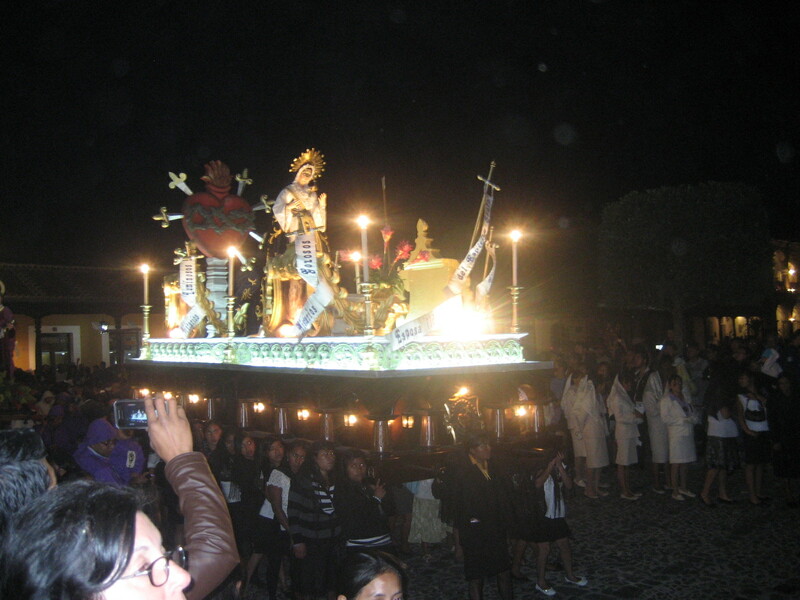 The streets to the church was clogged as the masses gravitated towards it. 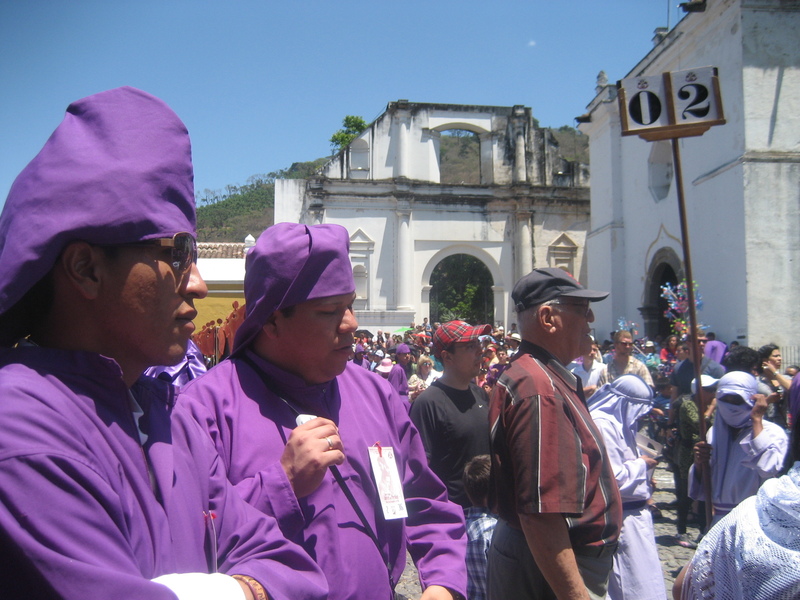 When I arrive, the church plaza was FILLED with people (including many in costume) and I discovered that one of the two processions–a hallmark of Antigua Semana Santa–of the day was just 30 minutes away from departing the church. Perfect! Since I hadn’t shown up early to secure a spot in the shade, I thought no harm in exploring the grounds while I wait. Poking around the side courtyards however unintentionally led me to a back entrance and I wound up behind the altar with some other crafty viewers just as things began. Minutes after I arrived, kettle drums began to pound and I didn’t know what to expect. 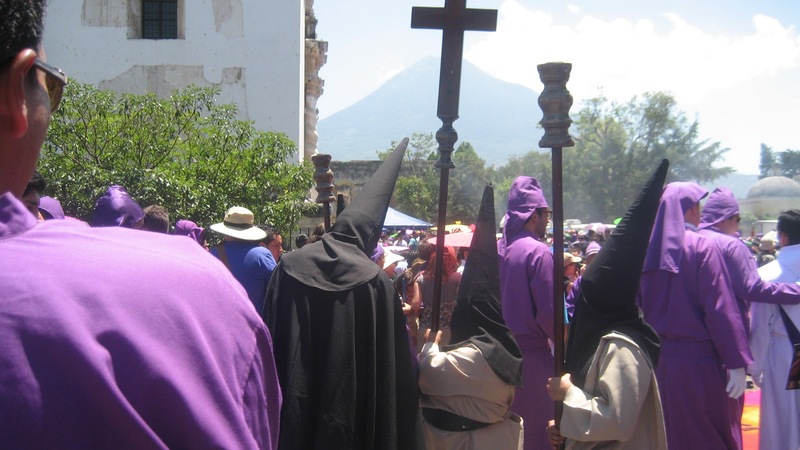 The men robed in purple swayed together under the weight, barely moving forward on each beat. Truly. Guided by acolytes, it took them over twenty minutes to exit the church. This pace continues as the procession winds its way around the city center for, depending on the route, up to fifteen hours. As they crept forward, the brass and percussion band played an ominous dirge. It was grand and grave. Rarely do I ever kneel and say a prayer but I did then. 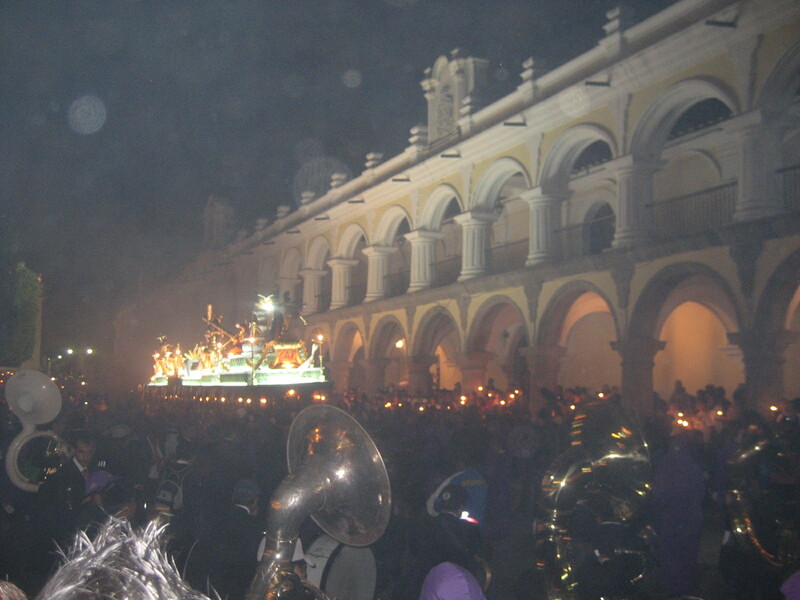 Each procession has a theme within the timeline of the passion and participants wear costumes and carry different props depending on the float. This one told the story of Jesus’ final steps before his crucifixion. 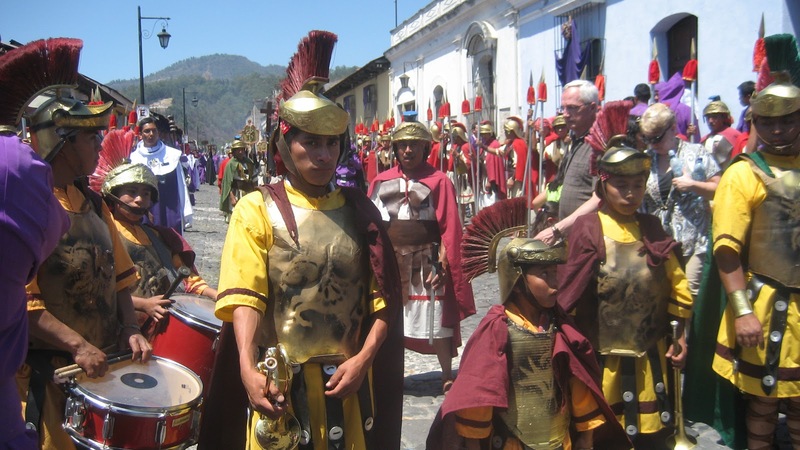 Roman soldiers led the way, then placards with the stations of the cross, boys lugging a large wooden cross, incense bearers, the main float of Jesus flanked by thirty men in purple on either side, then a weeping and holy Mary followed by saints, and of course the band. Waiting their turn to join in. 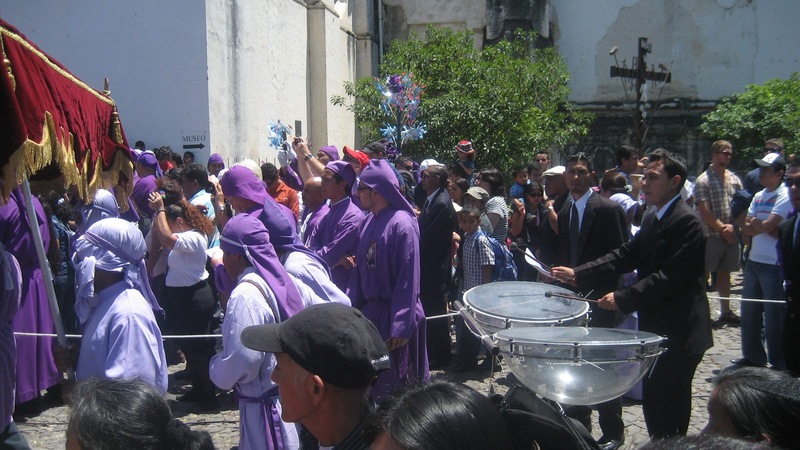 The procession meets the crowd amassed outside Iglesia de San Francisco. Men penitently bear their burden. Mobile tympani setting the tone and pace. After the procession passed, all the watchers moved towards the bottleneck exits of the courtyard and experienced the slow pace of movement demonstrated by the procession walkers. 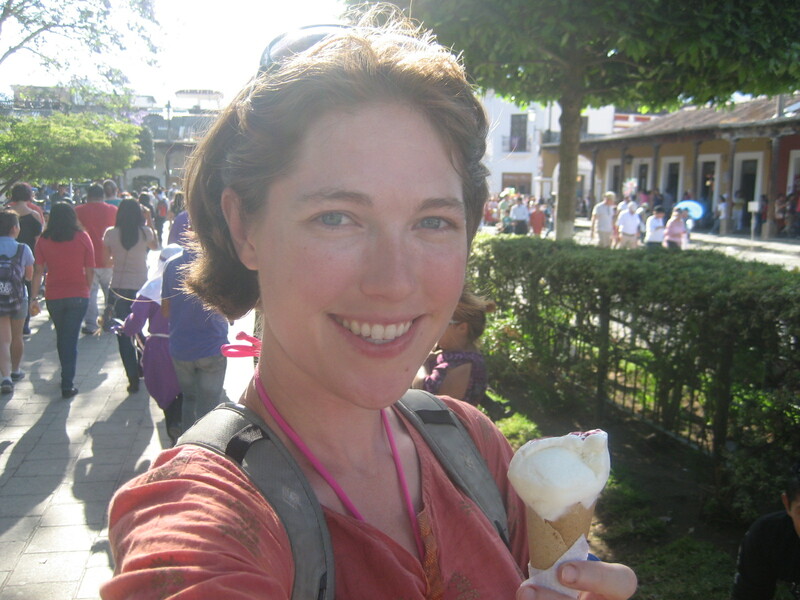 I broke for ice cream and to pick up my laundry (a Semana Santa miracle finding an open launderia!). But I felt comfort knowing the processions were out in the city on the move. Orchestrating large groups of people fascinates me and this whole event looked like a challenge. Carrying the giant wooden platform is a somber act of penance that thousands of men, women, and children participate in throughout the week. The priests do an excellent job of keeping everyone on track. All participants take turns rotating positions; during each multi-hour procession there are multiple shifts and each person has a badge that specifies exactly where they are supposed to be. The physical act of guiding turns and keeping the float moving straight is also a feat of coordination. 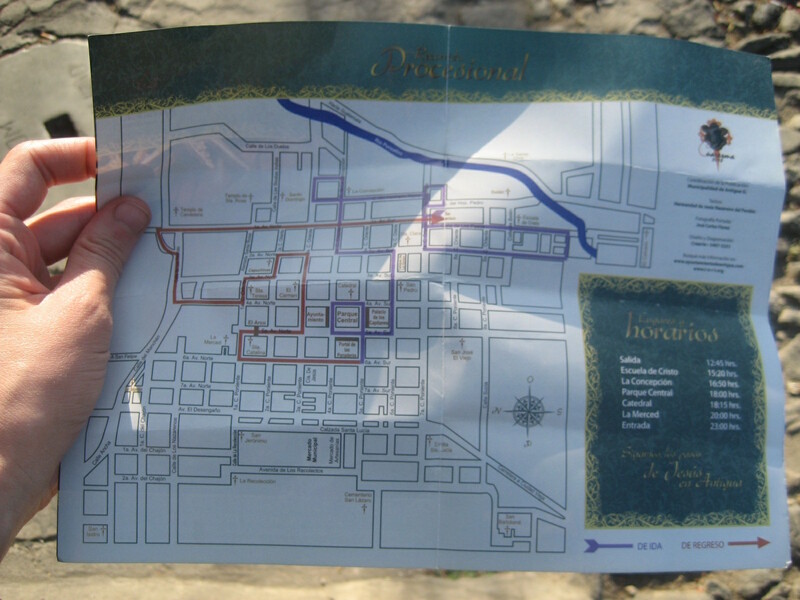 At information booths throughout the city you can get a map of the procession routes a schedule of when they will reach city landmarks. They hit those marks with impeccable precision. Waiting their turn near the group two position. I met up with the processions again just after sunset in the Park Central, one passed at 6pm and the other at 7:30pm. Dozens of harbinger incense bearers choked the air with smoke. This time, preteen boys carried Jesus on their shoulders, clearly hurting but pushing through. 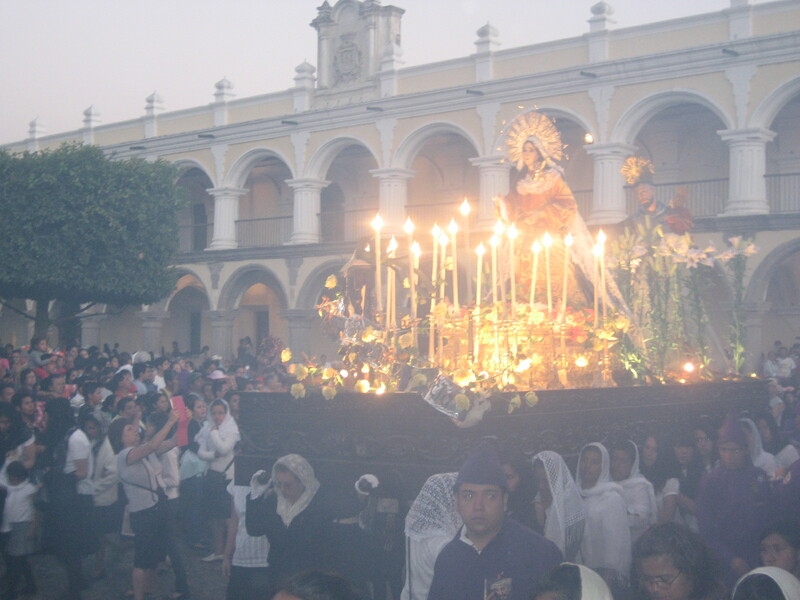 Women followed behind with an illuminated Mary. More participants escorted the procession of the appropriate gender for each float and held a walking vigil in parallel. It is incredible and moving how many people come together to experience and feel the story of the passion together. Women bearing a mournful Mary. Another Mary later, headed the opposite direction. Can you smell the incense?